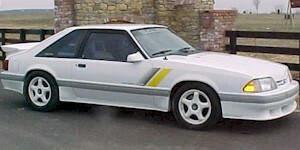 The 1989 Saleen Mustang saw minor changes over the 1988 conversion gear. The big changes were a new rocker panel striping design and a new SSC hatchback model. Standard equipment included a top-shelf Pioneer KEH 6050 AM/FM cassette & BP 850 graphic equalizer audio system, 225/50VR-16 General XP-200V tires, Monroe stocks, Saleen style aerodynamic body kit, 170mph speedometer, Hurst shifter, articulated FloFit sport seats, and a special Momo steering wheel. 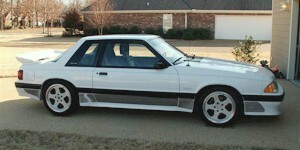 You even got a Saleen Mustang jacket to wear. For the new SSC, a tweaked version of the E-code 5.0L was installed. It put out 292hp with a 65mm throttle body, new intake plenum, larger cylinder head ports, wider rocker arm ratios, HD cooling system stainless tubular headers, and Walker Dynomax mufflers. 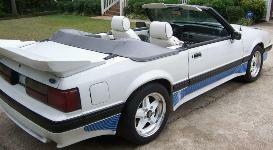 All the SSCs were painted white with gray/white interiors.